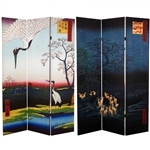 Our art print room divider folding screens are double sided made from durable stretched vinyl canvas. Light weight, attractive, functional and easy to clean. 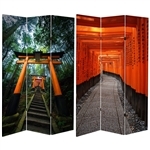 Each panel measures 15 3/4"W x 70 7/8"H. Just like common images on posters, these images look absolutely stunning printed on a functional folding screen. 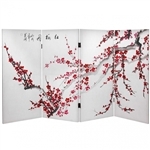 Images of Hindu Om, Yin, Ganesh, Buddhist and Zen art, Quan Yin, Ying Yang Bagua and Buddha. 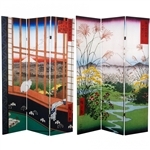 We also have stunning images of Buddha, Quan Yin & Ganesh statues, Buddhist & Zen art, the Yin Yang Bagua & Hindu Om. Also check out our Asian architectural photography such as the Great Wall of China. 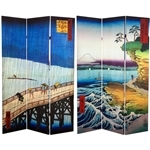 If you are purchasing a 3 panel room divider and would like it to be free standing or floating in your room. It is highly recommended to purchase a stand for extra stability and balance.